So here we are! 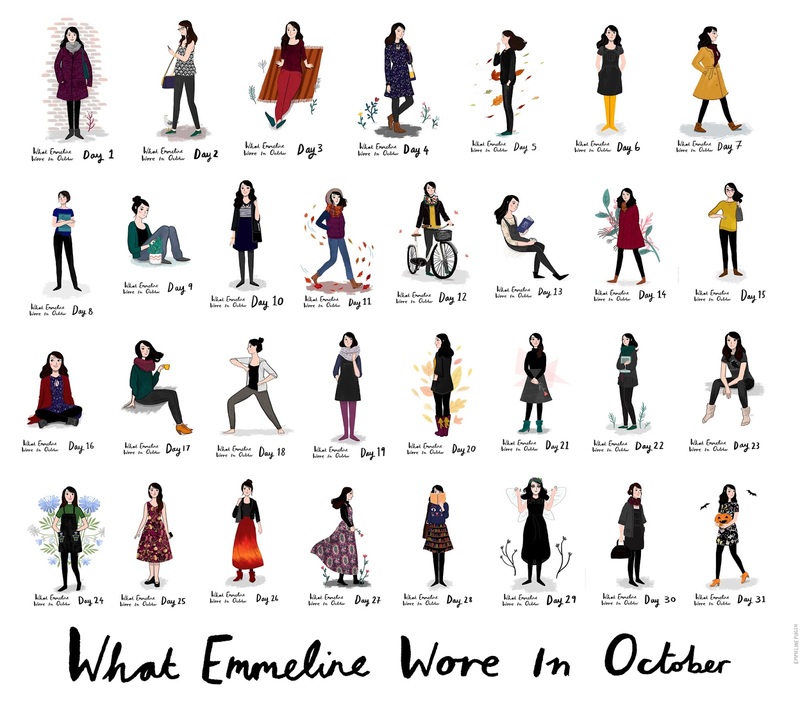 The full 31 days of outfit illustrations for my 'What Emmeline Wore In October' series (click for full resolution). I'm not going to lie, it's felt quite luxurious to not have to draw my outfit for the past couple of days, but that said, this project has been an absolute blast. The year's series is an Autumnal edition of my 'What Emmeline Wore In July' project from last Summer: the challenge to create an illustration of my outfit each day for the entire month as an illustrated twist on blogger's 'What I Wore' fashion photographs. I started this project as a creative challenge, and I'll admit it has been trying at times (especially on weekends where getting up early to do work isn't exactly lovely!). But all in all, this project has been amazing at spear-heading my motivation in all areas of my creative work, encouraging me to learn new techniques, honing my skills, and giving me a bit of an extra insight into what I actually enjoy illustrating. A lot of people have commented saying (and I quote), they'd have 'the wardrobe variety of a cartoon character' if they'd have done the project! I have to admit, a lot of the time, my default is black skinny jeans and some kind of jumper. I start work quite early in the morning, so it's a kind of roll out of bed into the first thing I find kind of method (aside from the days where I stay in pjs for a little too long...). But that's another one of the huge benefits of doing this project, it encouraged me to mix things up a little with my wardrobe, and dust off a few of the outfits that are a little more 'statement' for day to day wear and really embrace a bit of variety. Running the project in Autumn also gave me the chance to truly run with my passion for scarves, mustard yellow, and cosy coats. I'm definitely an Autumn girl at heart! I also want to say a huge thank you to the companies that collaborated with me on the series: Fat Face, People Tree, White Stuff, Joanie, Oasis, Lowie & The London Fashion Agency, Joy The Store, Yumi and Joules. Honestly, they're some of my favourite (and the nicest!) brands ever, and they've been absolutely amazing. It's also meant so much to me to have had such incredible support from you guys! Having a snoop on the analytics this morning, I've seen that the project has had over 100,000 views this month, tens of thousands of likes and shares across social media, as well as features on the likes of Design Week, Uppercase and Amelia's Magazine. It's just floored me! Thank you so much. If you're an illustrator, I can't recommend daily drawing enough. It can be really hard work, but it's so worth it for what you get out of it. Taking on a 'What I Wore' illustration series adds its own challenges, as obviously it's going to be a self-portrait each day (which are notoriously difficult!) as well as that emphasis on a variety of poses, and with character consistency, which is a hugely important thing in illustrating for books and comics. Shared publicly, or in a secret sketchbook, there's nothing more important than taking the time to practice and discover what it is that you love to draw - because in the end that's what makes your illustration unique, and your creative passion will show through your work. If you fancy a look at each of the illustrations in detail, the full series (and a kind of diary for each day and outfit choice) is available on my blog here. You can also see the illustrations using the hashtag #wewio on Twitter, Tumblr, Facebook and Instagram, or over on Bloglovin'. Now for a well earned break!